Where do used skateboard decks go when they die? If they fall in the hands of Alexander Michael Wong, they’ll be reincarnated as tables, cutting boards, picture frames, coasters, bottle openers and keychains. 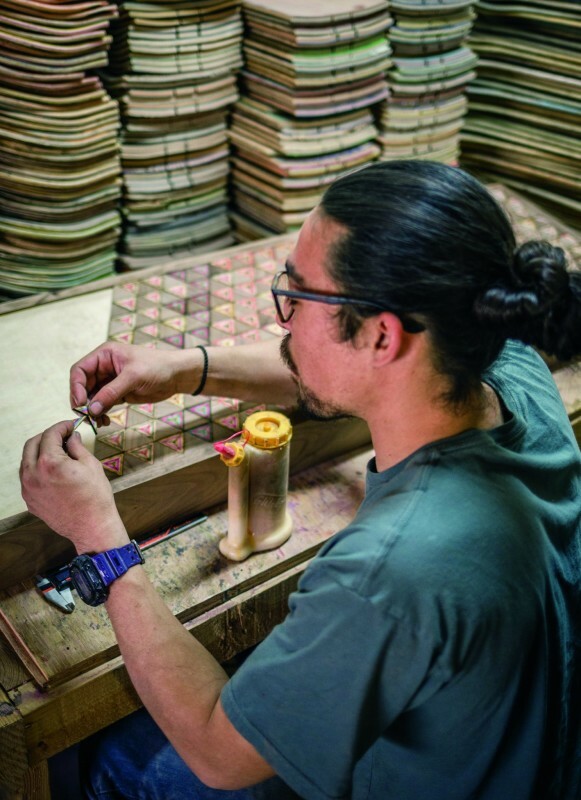 For the past few years, Wong has been running Upcycled Skate Art, a company that turns used skateboard decks into furniture, household items and topographical maps, among other things. Wong, 31, moved to Santa Cruz from Santa Barbara in 2015 to attend UC Santa Cruz, where he rekindled one of his old passions. “I got fat and old and hadn’t been on a board in a while, so I started skating a lot more,” the Santa Cruz-based artist recalls. Then inspiration struck. While completing a major in economics, he began making functional art from skateboards to relieve the stress that came from constantly creating spreadsheets and reports. 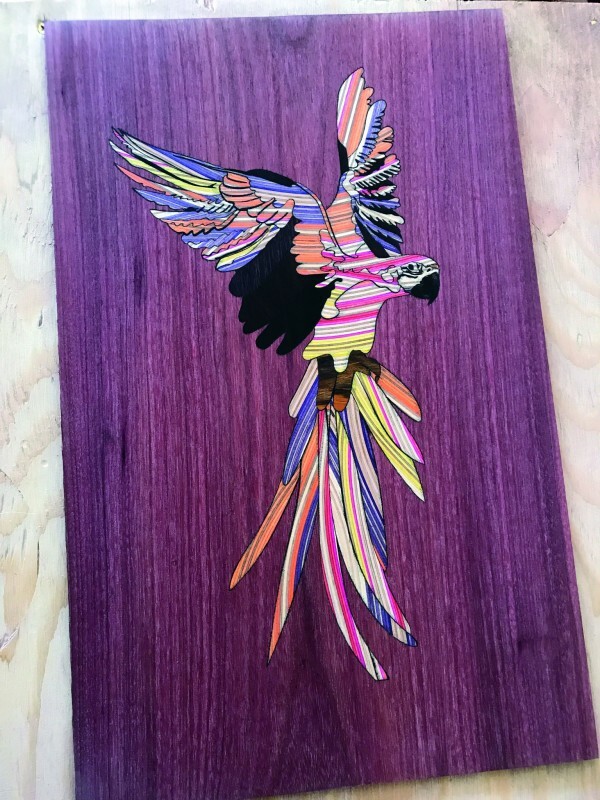 Wong, who used his old decks as wall decorations while in middle and high school, took on his first skateboard art project at the request of his youngest sister. When she asked him to make her a Christmas gift out of his used boards, he rose to the occasion by crafting an iPhone speaker amplifier. He has since replicated this design many times for commission orders. The friendly artist estimates that he has used 400 or 500 decks in projects for Upcycled. He names the colorful five-layer laser-engraved topographical maps that he makes in collaboration with Santa Cruz Engraving as some of his favorite pieces. 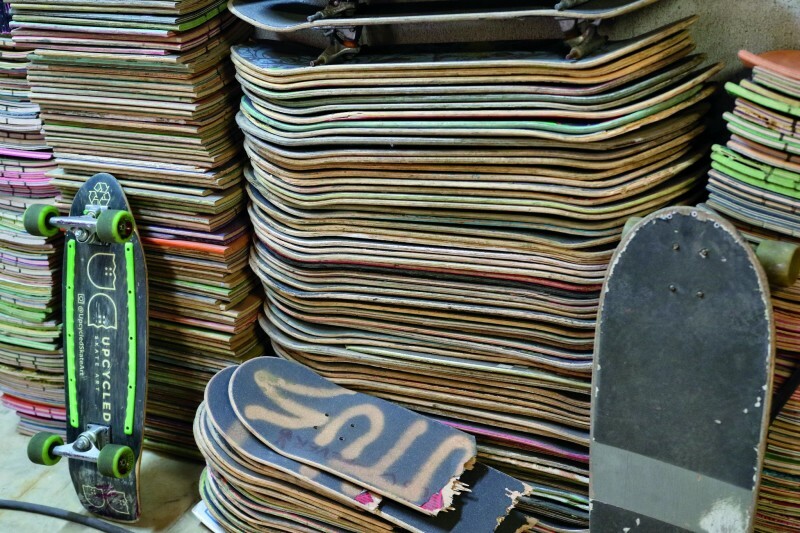 All of the boards that Wong uses come from local skate shops and skateboarders. “When I skate at parks, people I skate with will collect some boards and throw them my way when they see them around town,” he explains. In addition to having collection bins at Santa Cruz skate shops like Bill’s Wheels, Skateworks and Pacific Wave, he stops into different shops whenever he’s on the road and grabs any boards that are taking up space. Some people also send him their used boards or simply drop them off at his doorstep. 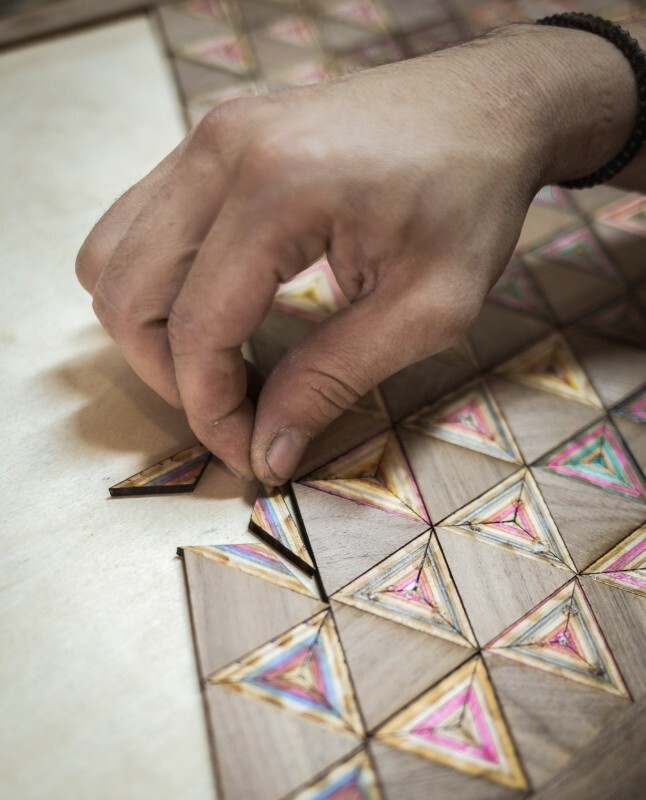 While growing up, Wong acquired skills that have aided him in creating designs for Upcycled. As the nephew of a general contractor, he grew up taking summer jobs in demolition, framing and roofing. His background in woodworking is compounded by his strong understanding of math and geometry, at which he excelled from an early age. Fun as it might be to create art from a skateboard, some parts of the process are downright tedious. The first step—getting rid of the grip tape and the residue that it leaves—is by far the hardest. “There’s really nothing fun about it, ’cause you’re losing your fingerprints, scraping your nails and getting cut up,” Wong states. 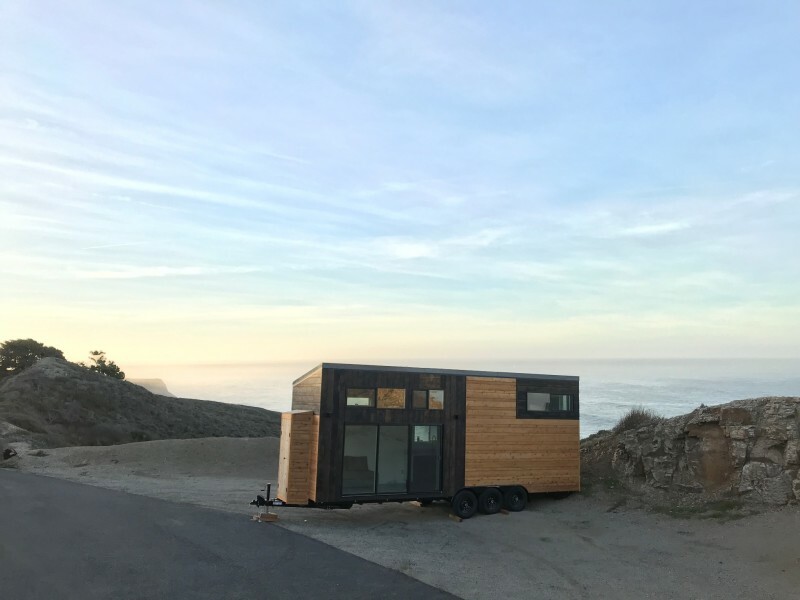 Those who aren’t quite ready to make the move into a tiny home can still help promote sustainability by purchasing Upcycled Skate Art’s products. In addition to several shops in the Santa Cruz area, the company’s wares can be found in the Campbell gift shop Redemption and in two different stores in Phoenix, Ariz., or you can just do your shopping online at upcycledskateart.com. This entry was posted in Art, Environmental, Featured, Local Loop, Opinion, Spotlight. Bookmark the permalink.